This document is based upon the requirements of the federal, state, and city law, regulations, and policies. 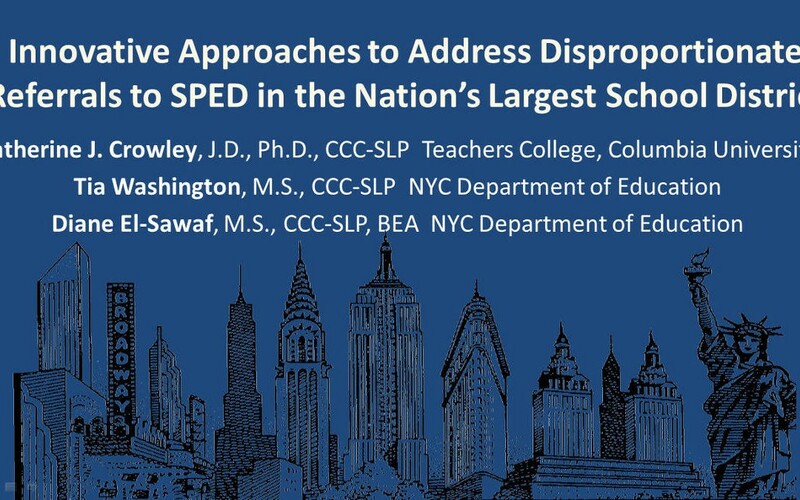 Cate Crowley from Teachers College, Columbia University along with Tia Washington and Diane El-Sawaf from the New York City Department of Education (NYCDOE) discuss measures taken to combat the over referral of students from diverse backgrounds for special education services. This is a special education field advisory that was released in December, 2014. It details the use of standardized scores with culturally and linguistically diverse children. This document presents why a shift in approach to disability evaluation of preschoolers from culturally and linguistically diverse backgrounds is needed. This memo outlines current issues in the speech and language evaluation process in New York. This is a policy document published by the American Speech-Language-Hearing Association (ASHA) establishing its position on what skills are needed by speech language pathologists in order to work competently with culturally and linguistically diverse clients.